I love the idea of having a chocolate cake as your wedding cake. It’s so non-traditional – even if I keep seeing it mentioned on wedding websites. It seems that people just can’t get past the notion that wedding cakes should be frosted with white icing. Around here, we prefer chocolate icing! Actually, anything chocolate gets top billing so today’s featured cake is wedding cake perfection! 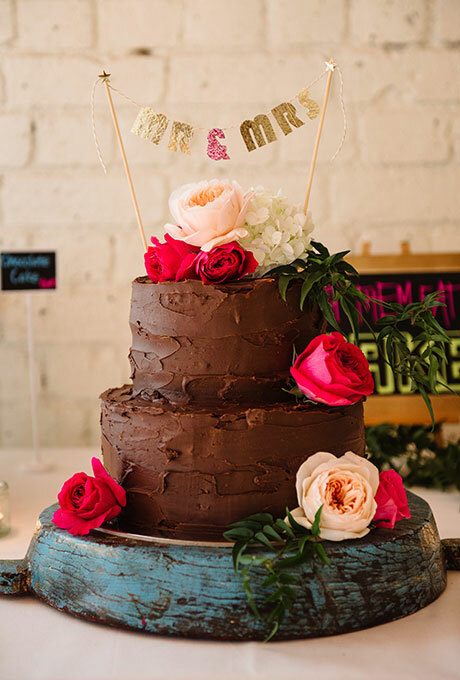 The addition of some bright blooms makes the cake pop – and insures that it doesn’t look like a birthday cake. If you’re thinking of a cake like this for the fall, I’d recommend Gerbera daisies or another “fall” flower as an embellishment. You’ll find this lovely chocolate confection here.